It's max week this week at the box. Instead of workouts, we stretch a little and then start to build up to our one rep max of the lift we're doing. We started the week with back squats. All of the guys love back squats; I like them too. I think they're a favorite because most people can back squat heavier than they can lift any of the other lifts. My previous PR (personal record) was 90 pounds. I squatted 120 and could have upped that another 10 pounds at least, but I was nervous about getting stuck at the bottom and having to bail which I've never done. do about handstands, but not quite as panicky. When I told my coach I was hesitant about lifting to failure because I had never bailed on a lift before he said we would practice at the end of the class. There was another lady my age in the class who had never bailed either and was worried about it too. First the coach showed us how to let the bar go and jump forward. I practiced with a pvc pipe first and I'm glad I did because I dropped it on my lower back the first time I tried it. Then we practiced with 35 pounds and I think I got the hang of it--hopefully I won't be as nervous about it the next time we back squat. I do think it's an age thing though--none of 30 somethings in the box seemed to be worried about how to bail. wait until my world stopped spinning before I could complete the jerk. My coach says this is common because the bar hits your windpipe when you clean properly--I think that's part of it, but I also think I have a tendency to hold my breath which probably contributes to the light-headedness. Thursday was a ROM WOD--aahh, I love yoga days. ROM stands for range of motion wods and I'm lucky to be at a box where we have recovery days like these. They really help with mobility and soreness. Friday was hang squat cleans. This is one of my favorite lifts. Since you're not lifting from the ground there's not as much to mess up, and being able to receive the bar in the squat position makes it easier to lift more weight. I PR'd at 90 pounds fairly easily and only stopped because we ran out of time. So that was max week. It was really fun to see the gains from all of the hard work I've put in this past year. It's hard like a basketball, but a little smaller. The 14 and 20 pound balls are cushier and similar to the ball used in the video above. I'll post an update tomorrow and let you know how my legs feel. This is a simple, but seemingly very effective inner thigh and booty workout. Does CrossFit Make You Sore? When I first started CrossFit, I only went twice a week. My neighbors and I would tell each other that we didn't want to get hurt, and we were too sore and we really needed to ease into this crazy, intense exercise program. I was very sore--boy, was I sore. My first CrossFit coach, Josh, would always encourage me to attend more frequently because CrossFit is programmed to be 3 days on, 1 day off. Because I only was going twice a week I missed a lot and didn't progress very much. I had a hard time remembering how to do the Oly lifts, and every wod was difficult. Due to Josh's encouragement I started going 3 times a week--he insisted that I would never make any gains going just twice a week. I did notice an improvement in my ability to complete the workouts. I became more fit and my body started to change, but I was still very sore after most workouts. Josh started encouraging me to come 4 times a week, but I wasn't willing to sacrifice the time. I was attending a 9:30 am class and it would really eat up my whole morning. When the gym was bought out by the crazy owner, 3 times a week was my max. I was so exhausted by the intense workouts that there was no way I could add another day. There were many days I could hardly function because I was so wiped and sore from my workout. Fast forward to today and I am now going to CrossFit 4 times a week and I am rarely very sore. Sure, there are some workouts that can still make my muscles scream (overhead plate lunges, anyone? ), but for the most part, I feel really good. I've found that the best schedule for me is to workout Monday, Tuesday--take Wednesday off, workout Thursday, Friday, and take the weekend off (unless the coach is having a seminar or special wod on a Saturday). I truly believe that I am less sore because I am working out more--sounds counterintuitive, doesn't it? My current box owner/coach is very tuned in to preventing injury so he programs very carefully. If we have a couple of days with high intensity/high weight wods, he'll throw in a mobility day with some light lifting or gymnastics to make sure we don't overtrain. All of the mobility we do helps a lot with soreness. We do a lot of foam rolling which is really important--the foam roller helps to massage your tissues and tendons--I'm not going to lie--it hurts! But it helps to prevent injury, increases mobility and makes you feel better and less sore when you're finished. This is similar to what we use in the box. What I''m not sure about is whether the reduced soreness is from working out an extra day a week, or the mobility work--it's probably a combination of both. Since I have belonged to other boxes, I know I am very lucky to have found a coach who emphasizes mobility and is very mindful with his programming. I would highly encourage anyone--especially us older folk--looking for a box to make sure the programming includes a lot of mobility work--and also to look for careful programming that has more to it than just the difficulty factor. Just because a coach can reduce you to a sweating mess at the end of a wod, doesn't mean he always should. is my weakest lift, and since the wod called for 60 overhead squats, I decided to only lift 25 pounds. They are very nice looking and a couple of the women at my box have them and love them. Only problem is the price! I'm hoping it will go down in a few months--especially if they come out with a Metcon 3. If I do get them, I'll definitely let you know if I like them, and if they make a difference in my workouts. The wod started with the run--I was the oldest in the group by at least 20 years, and was thinking that I would definitely be pulling up the rear on this workout, while hoping that I wasn't minutes behind the last person to finish, and also hoping that I could beat the cap. That's why I generally don't like the 'for time' wods. It's the absolute worst when everyone's finished and I'm still grinding. That used to always happen at my old box and it stunk--even though everyone was always super encouraging and would cheer me on until I finished, it was still somewhat humiliating. --As expected, most of my box mates took off on the run, although there was one guy who held back with me--I am always strategizing these workouts and knowing that I had five rounds of this, I didn't want to wear myself out on the very first 400. I came in last from the first run and was a little winded, steeling myself to the fact that I was destined to bring up the rear in this wod especially since the only other female, a 20 something, was using the training bar without any plates (15 lbs) for the overhead squat since she has ankle mobility issues. I picked up my bar, snatched it overhead, and started in on my squats. The 25lbs didn't feel too heavy and I was able to string together all 15 squats pretty easily. I have good hip and ankle mobility, but bad shoulder mobility so the overhead squat is a bit of a conundrum for me. 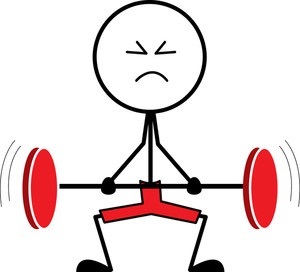 I am so afraid of hurting my shoulders that I don't want to strain them by lifting heavier weight, even though I am sure I could. My one rep max is 35 lbs, but that's because I haven't tried to lift heavier. My shoulders are always a little dinged up after doing the wide grip overhead work and increasing my weight is just not worth it to me. A couple of the guys were Rx'ing the workout and they had to split up their overhead squats since they were so heavy, so I was able to catch up from being last on the run and finished my squats around the same time as most everyone else and started in on the second run. I came in for my second round of squats winded, but picked up my bar and started grinding. I was able to string all 15 together again--my bar was definitely too light, but in retrospect, considering how my shoulders feel now, using 25 lbs was the right call. Everyone else was starting to slow down, even the young woman who was only using the training bar, and on some rounds, the PVC pipe--she must have been having a hard time with her squats. So I finished the second round before everyone and started on my round 3 run. The middle rounds are always the hardest--I do a lot of talking to myself, especially on the runs--telling myself to just keep moving--a lot of the mental toughness I've written about has to kick in on these rounds. I was happy to not be the last one, lol, but also wishing I had someone else running near me for motivation. The last few rounds went the same way--I was able to do all 15 squats unbroken and finished the wod first--lol--I was surprised, but the overhead squats were the separator and the guys lifting heavy were really slowed down by their weights. One of the guys couldn't finish--he had gone too heavy, I think, and was just fried. My final time was 15:46. Not too shabby for an old lady--however, in the class before, the women killed it--lifting heavier than me, and finishing minutes before me. But at least I was able to keep moving and finished in a respectable time. I had never done 'Nancy' before and was happy to get a time for her under my belt. I look forward to tackling the rest of the girls in the future--although maybe not the very near future! Have you been watching the 2016 CrossFit games this week? They've been streaming the prelims on the CrossFit.com website and they are broadcasting the finals on ESPN this weekend. If you've never watched a CrossFit competition, you'll be surprised at how entertaining it is. The competitors range in age from teens to over 60 and they are pretty amazing to watch. The athletes are all pretty fine physical specimens--muscular and very fit, so what separates the great from the good?--It's pretty obvious that it's mental toughness that puts the athletes on the podium. Am I mentally tough? That's a big fat no--but I'm working on it, and CrossFit is helping. If you've ever run any distance, you know that your mind plays a huge part in running. You're tired, your legs hurt and your mind is telling you to stop--you're not going to die if you keep running, lol, but somehow your mind convinces you that you will, and you stop--at least, I used to. No mental toughness at all, and I can't blame it on my age because I've never been mentally tough. But CrossFit is slowly changing that. When I'm in the middle of a killer word and completely out of breath and I see box mates pushing through their exhaustion it gives me the extra push I need to keep going, so I do. It was an extreme cardio workout and I was having a hard time catching my breath. I had come in from the run portion and cleaned my bar to begin the front squats. I was tired and just cleaning took an effort--I can't remember how many squats we had to do, but I was planning on splitting them up because I was so winded, but the problem with splitting the lifts up is that it takes a lot of effort to clean the weight from the floor. So I made the decision to not put the bar down and pushed through all of the front squats, resting with the bar on my shoulders when I needed to. I surprised myself and my box mates, but was pretty proud of myself afterwards for pushing through. I was reading about one of the female competitors who has a chance to win it all in the Games this year, Sara Sigmundsdottir, and she said that to toughen her mind she will do 1000 burpees for time so when they show up in a wod, she knows she's done 1000 burpees so what's a few hundred? Lol. I've thought that I should try the same thing--maybe not 1000 burpees, but try to do 100 a day so when I have to do them in a workout, my mind will be prepared. I've noticed that I use the mental toughness I've gained in CrossFit in my everyday life. When I'm tired and don't feel like cleaning, or folding, or going to the grocery store, ( first world problems, I know!) I recall my workout that morning where I lifted that extra weight or ran that extra lap and realize that my everyday chores really aren't that bad. Just another positive that CrossFit has brought to my life--I hope you are encouraged to try it, and you can reap the benefits of CrossFit too. I have seen so many positive changes in myself this year from CrossFit. ...35 pounds above my head more than a few times. The weight felt so heavy--I really thought there was no way I would ever be able to lift that kind of weight, lol. sit ups. If I recall correctly, we were supposed to alternate between 25 goblet squats and 50 sit ups for 2-3 rounds. Sounds pretty easy, right? Except I couldn't even make it through the sit ups. By the second round I was really struggling and probably only ended up doing about 25 in the second and third round. That was really a wake up call--I was weak and I was terribly out of shape cardiovascularly. While most people focus on the major injuries you can sustain from doing Crossfit (SLAP tear, ACL tear, back injuries, hamstring and quad pulls), it's the small injuries, bumps and bruises that are much more common. I was comparing elbow wounds with a young man I partnered with in a Wod where we had to crawl under each other. We both were bleeding on our elbows and knees when we were finished, and I had some ugly bruises pop up in the days following that workout. He was telling me that his wife gives him a hard time about always getting scraped up (poor guy). Before I started CrossFit I didn't realize just how scraped up I'd get on a regular basis. Today we did a WOD with box jumps. We did them so much at my old box that I really didn't think much about an AMRAP with 25-50 box jumps. We also practiced jumping higher than the 20 inch box so I felt pretty comfortable doing them. We don't do them as much at my new box and I've found myself doubting the jump. You're standing in front of a 20 inch box with tired legs and your mind is going 'nope-no way are you going to clear this". I have never fallen while doing one, but I've hit my toe a couple of times on the box which could have led to a spectacular fall if I hadn't caught myself. A box jump injury can be baaaad. Most people catch their shins on the edge of the box and scrape the heck out of them. Or they tumble head first over the box onto the floor. No bueno! Just google box jump injuries and you'll see what I'm talking about. So today, one of my box mates who is a woman about my age fell on a box jump. She hasn't done many jumps and was hesitant about trying. We had just done a lateral crouched shuffle and the legs were feeling very much like jell-o. There were several women using a 12 inch jump over, but it was an AMRAP and she didn't want to wait. She caught her shin and then slid down the edge so she had about a 5 inch gash on the front of her leg. She finished the WOD because she is fearless, but I know it really hurt. At the earlier class, another woman my age was trying to jump over the box--yes, she's a beast!--and her momentum took her over the box onto her face. Luckily she wasn't hurt, but it could have been bad.